Home \ Blog \ Debt \ Can I Pay Off My Consumer Proposal Early? Are you currently working through a consumer proposal? Have you been diligently making your payments on time and hoping for the end? What most consumers don’t know is that it’s possible to pay off a consumer proposal ahead of schedule. The question is though, when is it the right decision? Will your creditors accept your consumer proposal? Find out here. Before we talk about the possibility of paying off your consumer proposal ahead of schedule, let’s quickly summarize what a consumer proposal is and how it can help with your debt situation. How much debt should you have before filing for a consumer proposal? Find out here. To qualify for a consumer proposal, the following conditions need to be met on your part. Only certain types of unsecured consumer debt qualify. For example, credit card debt does qualify, while mortgage debt does not. You’re only permitted to have one active consumer proposal at a time. You must be able to prove that you have an income that’s steady enough to afford all your future payments. You’ll have to attend a number of mandatory credit counselling sessions. You’ll need to hire a licensed insolvency trustee, a legal professional that’s trained to deal with extreme cases of debt that lead to consumer proposals and bankruptcies. With the help of your trustee, you’ll come up with a proposal to submit to your creditors. Your trustee will then reach out to your creditors your behalf with the proposal. Want to know how long it takes for a consumer proposal to be accepted or rejected? Find out here. If your proposal is accepted, all debt collection efforts, mounting interest and penalties, and wage garnishment will cease immediately. You’ll begin making installment payments (usually monthly) through your trustee until the proposal is finished. You’ll have a maximum of 5 years to complete your proposal. A record of your proposal will remain on your credit report for 3 years after you’ve finished making payments. You won’t have to forfeit your assets (car, home, etc.) like you would with a bankruptcy. The possibility of advanced payments that could reduce your payment period (keep reading for an explanation). As detrimental to your credit and finances as a consumer proposal can be, you should ideally be out of debt within a few years, as long as you make all your payments on time and in full. Be very careful! If you miss 3 payments (2 missed payments is not recommended, but acceptable without penalty), your proposal will be annulled and you’ll have to start the process all over. 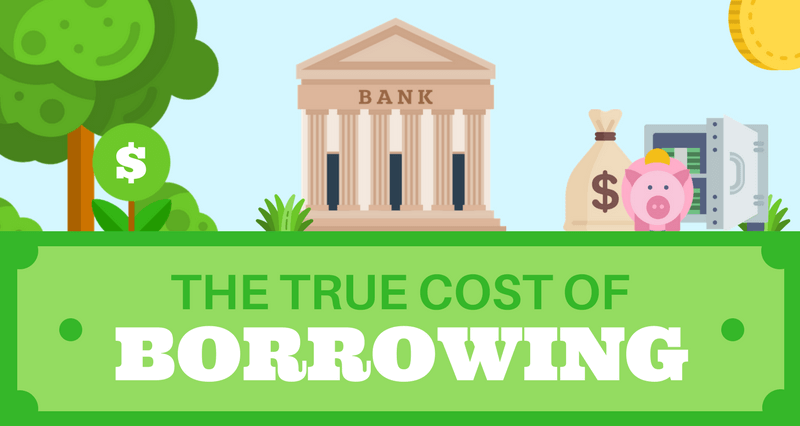 Ever wonder what the real cost of borrowing is? Take a look at this infographic. As we mentioned, a consumer proposal is one of the most drastic debt elimination steps you can take. Nonetheless, it is still less harmful to your finances than declaring personal bankruptcy. Distinguishing between these two options can be a bit confusing, as they both involve similar procedures. In the case of a bankruptcy, you’ll also be filing a legally binding agreement, as well as making scheduled debt payments to an insolvency trustee. Additionally, you need to be at least $1,000 in debt and any collection efforts, mounting interest, penalty fees, and wage garnishments should cease. Click here for more information about calculating bankruptcy payments in Canada. If your debt is large enough, your assets may be seized as payment. Your payments are made directly to the court and while your payment period will likely be shorter, they may be larger than those of a consumer proposal. Again, only unsecured debts qualify (credit cards, income taxes, etc.). Any credit accounts associated with the bankruptcy will be frozen. You may have to make surplus income payments if your regular income exceeds a certain amount. You’ll be given an R9 credit rating (the worst of all) and your credit score will be damaged far worse than with a consumer proposal. While the length of your bankruptcy itself should only last 9 months, a record of it will show up on your credit report for 7 years per filing. During that time, it will be very hard for you to be approved for any credit products. Change your payment frequency – While a consumer proposal generally involves monthly payments, you can also increase them to bi-weekly (one payment every 2 weeks). This will allow for one extra payment per month. Increase your payment amount – Before the process begins, you and your trustee will agree upon payment amounts. However, you can always request to increase those amounts. Even an extra $50 per payment can make a significant dent in your payment schedule. Make lump sum payments – Another benefit to consumer proposals is that they allow you to pay in lump sums throughout your payment schedule. So, if you receive a work bonus or any extra income, you can put it toward your proposal and pay it off earlier. If you want, you can even pay off your total debt in one go. Click here to find out if you can amend your consumer proposal. Yes, it can certainly be beneficial to pay your consumer proposal ahead of schedule. However, before you try it, make sure you understand the potential consequences. While we’re going to list some of those consequences below, always discuss the idea with your insolvency trustee before you make your decision. There is no penalty for making lump sum or advanced payments. Your payment schedule will be shorter, so you won’t be stuck in debt as long. Since your proposal will be over earlier, you can start dealing with your 3-year bad credit situation faster. Fewer payments mean less chance that you’ll default in the future. Paying your proposal early means you’ll be spending more money with every payment. This could make it harder to afford your other regular expenses. If your income doesn’t support these larger payments, it can lead to you defaulting on both your proposal and your other outstanding debts. If you’re a homeowner and you’re desperate to avoid some of the financial damage a consumer proposal can cause, paying it off early by borrowing from your home equity could be the right option for you. Home equity refers to the real estate market value of your home versus the remaining balance on your primary mortgage. The more you pay down your mortgage and the more valuable your home becomes through renovations and real estate boosts in your neighborhood, the more home equity you’ll build. Once you have at least 20% equity, you can apply for either a home equity loan or a home equity line of credit (HELOC), which are commonly known as second mortgages. With a home equity loan, you’ll receive a set amount of money, which you’ll then pay back through installments. With a HELOC, you can borrow from a revolving credit line as needed, then pay back your borrowed amounts as you go. To see some ways of accessing your home equity this year, try reading this. Nevertheless, both equity products can then be used to cover various expenses, including debt consolidation, and in this case, the debt from your consumer proposal. Again, before you choose this route, be aware of the potential advantages and disadvantages of using your borrowing from your home equity for this purpose. If you have a large amount of equity, you can use it to swiftly eliminate your consumer proposal debt through larger payments or in one lump sum. Making timely, full payments for either product is good for your credit score and credit report. Healthier credit leads to better approval chances and lowers interest rates in the future. Since your proposal is dealt with quicker, you’ll once again be safe from defaulting on your payments. A consumer proposal, no matter how quickly you pay it, will damage your credit score. Not to mention all the prior credit damage from your previously outstanding debts. Having bad credit often means you’ll only have access to high-interest rates. By borrowing from your equity, you’ll be putting yourself in deeper debt, even when your consumer proposal is complete. You may not even have enough income to deal with your second mortgage debt. In addition to the significant debt your home equity product and consumer proposal can cause, second mortgages are secured against your home. If you can’t afford both payments, it could, once again, lead to default. You could risk your home being foreclosed on. Interested in Tapping into Your Home Equity? If using your home equity to complete your consumer proposal early or even to just pay off other high-interest debt is the right choice for you, Loans Canada can help match you with a lender who specializes in second mortgages.